We give Apple a lot of grief here for outdated software, lackluster hardware, litigating for a monopoly, designing form over function, needlessly restricting their App Store, engineered obsolescence, hyperbolic marketing and… where was I? Oh yes, despite all that, Apple makes a fine-looking phone operating system. 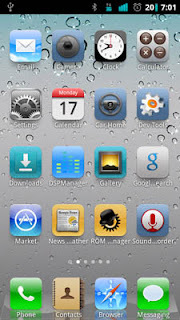 Many have tried and mostly failed to emulate the shiny, glossy look of iOS on Android, with possibly the best example being the custom ROM MIUI. If you’re not quite ready to take the flashing step, consider the new Espier Launcher, which will let you ape Apple’s darling design without lowering yourself to last year’s hardware. Espier has been in development for some time, but now it’s available via a free download on the Android Market fore anyone running Froyo or later. The custom launcher app replicates the iPhone homescreen almost exactly, displaying 4×4 grids of apps and not much else. You can pin apps to the dock or bunch them up into iOS 4 folders, or if you need to search and can’t bring yourself to hit the nearest capacitive button, just slide over to the left. All joking aside, it’s an impressive achievement, and there are worse (and certainly uglier) ways to get your homescreen on. Notably absent are any sort of widgets, resizing or many display options, but if iOS is your bag that’s part of the draw. There’s no app drawer because, well, they’re all right there, and the standard Android notification bar makes sure you won’t miss any alerts. Check it out in the Android Market before Apple stars launching their air-to-ground lawyers, and while you’re there, check out some other apps that have been performing iOS’s innovative “new” features for years.